A post-qualifying decision has seen the #7 Toyota sent to the back of the grid, giving Fernando Alonso and the #8 Toyota team pole position. 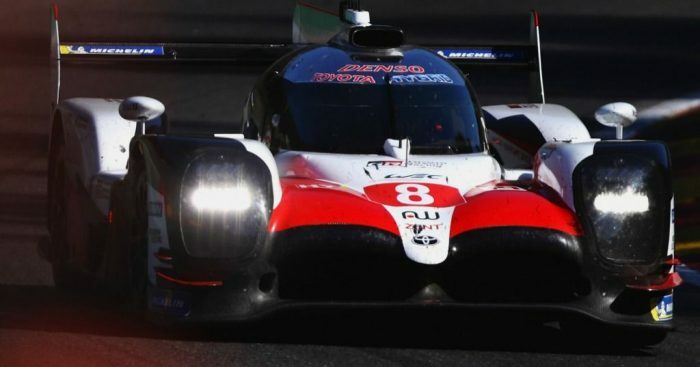 The two-time F1 World Champion, along with former F1 drivers Sebastian Buemi and Kazuki Nakajima will start at the head of the field for the 6 Hours of Fuji on Sunday. They had qualified second, but Jose Maria Lopez was caught speeding in the pit lane, meaning his times were deleted and the #7 car will have to start from the back of the grid. Lopez, along with Kamui Kobayashi, had given the #7 car pole position by just 0.091 seconds from Alonso and his crew during the qualifying session. However, soon after the end of qualifying, the stewards confirmed that the #7 would be sent to the back of the grid. The stewards also found that the #3 Rebellion car exceeded the permitted fuel per lap quantity limit, sending it to the back of the grid as well. With the two time deletions, Jenson Button and his SMP Racing team move up to start the race in P4 on Sunday morning. Anthony Davidson starts on pole position in the LMP2 class, having qualified three-tenths of a second clear of his contenders. Meanwhile, on Friday at the FIA World Motor Sport Council Meeting in Paris, the 2019/2020 calendar for WEC was confirmed. After the success of the inaugural super season for 2018/19, which started, and will end at Le Mans in both years, the WEC bosses have decided to go again. For next year’s calendar, though, there will be no Le Mans start. Instead, the season will get underway at Silverstone in September 2019, and run through to Le Mans in June 2020. There are also changes in length of race, with two four-hour races, three six-hour races and two eight-hour races, along with the 24H of Le Mans.